Turquoise is a Hydrated Copper Aluminium Phosphate that belongs to the phosphate class of minerals. Most specimens are cryptocrystalline, meaning that the crystals could only be seen by a microscope. The colour is blue but also occurs as, blue-green, green-blue, brown-green and sky blue, they have a dull to waxy lustre and are opaque. Turquoise is a valuable mineral and is possibly the most valuable, non-transparent, non-metal mineral in the jewellery trade, sadly that is why there are so much fake turquoise on the market today. 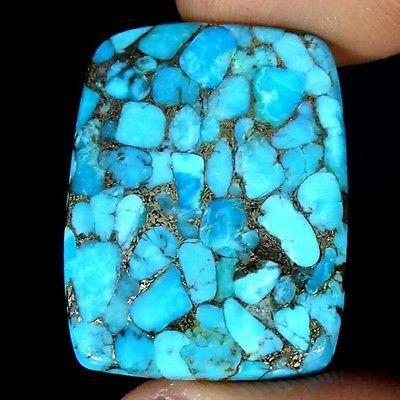 It is very rare to find Turquoise with a perfectly uniform and evenly distributed colour, there is only one mine in the would today that is producing this type of stone, it is the Sleeping Beauty Mine in the USA. 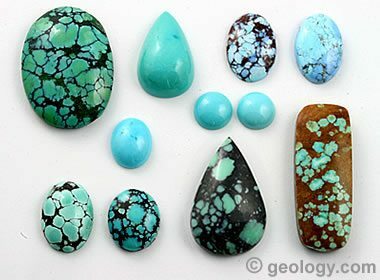 The matrix is the most obvious inclusion in Turquoise. It is the left over remains from the host rock in which the turquoise grew. The webbing can be black, brown, yellow or a host of other colours. Over long periods of time this matrix erodes away. When this happens the matrix and the Turquoise are at different heights and this creates a type of over growth. 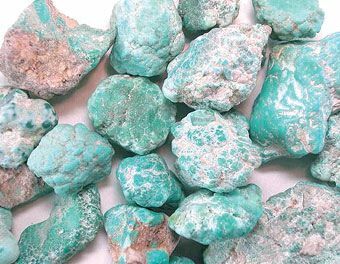 Mojave Turquoise, is a trade name for a stabilised, dyed turquoise that comes from the Kingman Turquoise Mine in Arizona. There are three different colours of turquoise created by this company; they are blue, green and purple. These stones start out as stabilised blue Kingman turquoise. It is dyed or colour enhanced and then goes through a bronze or copper infusion process that creates a shiny colour to the matrix. It is then formed, polished and set into jewellery. The Kingman mine is the only mine authorised to process their turquoise in this manner. ​The Sleeping beauty mine in Globe Arizona produces a small amount of sky blue turquoise with little to no matrix marks; that is reminiscent of the Persian turquoise of old. This is one of the few turquoises that don't require stabilisation prior to cutting and polishing. The stones are cut into cabochon and are very small. ​It connects physical and spiritual awareness, develops inner strength and calm. 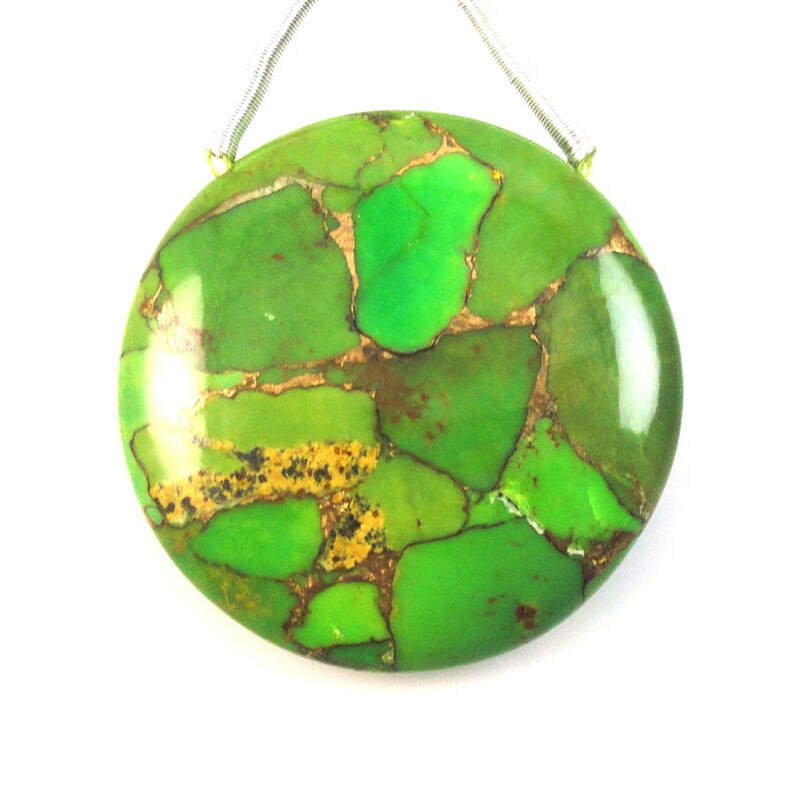 This is a stabilising stone that heals the emotions and the emotional body. It promotes communication and creativity. Traditionally used for protection blue turquoise also supports the immune system. Turquoise neutralises over-acidity and alleviates the symptoms of rheumatism, gout, stomach problems and viral infections. It increases physical growth, muscular strength, warmth to the extremities, relaxes cramps and has an anti-inflammatory and detoxifying effect. This stone is and excellent reminder to drink enough water. It also helps with healing maladies of the ears, nose, throat. larynx and neck. This is the stone for ENT Doctors, speech therapists, vocal coaches, singers, auctioneers, radio and television hosts. It helps oxygenate the blood and increase the amount of prana in the physical body. This stone assists in healing problems with your liver, anaemia, blood health, nerve endings, increases your physical strength, mobility, ear and inner ear infections. Turquoise will improve the eyesight, throat, bladder weakness, stomach acidity and stomach problems. This stone will ease the symptoms of rheumatism, gout, viral infections, it will relieve pain. ​It balances the entire Kundalini line. 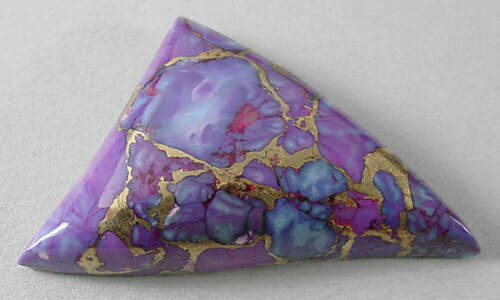 This stone operates as a link between the lower and higher kundalini chakras. It supports physical heart health. It is a very protective stone. It strengthens the meridians of the body and the subtle energy fields. It increases the physical and psychic immune systems. Turquoise supports the assimilation of nutrients and eases viral infections. It is especially useful for cataracts. Turquoise reduces excess acidity in the system and prevents reflux, rheumatism and the stomach. It is an anti-inflammatory and detoxifies the system. 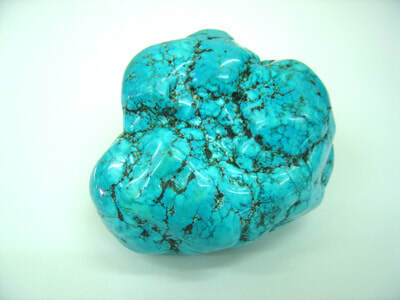 Turquoise balances extreme fluctuations of mood and dissolves an apathetic self martyring attitude. It also refreshes you when you are tired, down cast or exhausted. Turquoise protects you from sensitivity to outside influences. Turquoise balances the mood swings commonly associated with premenstrual syndrome. 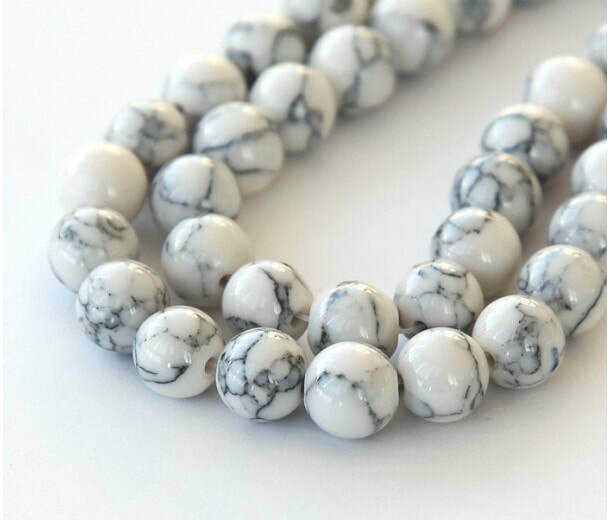 This stone helps to remind you that the feelings and realisations you receive during the premenstrual and peri-menopausal periods of your life are valid, and you are able to act upon them with grace and ease. This is a stone of validation when it comes to downloading wisdom and truth. Speak your truth with love and beauty. It shields the emotions, heals heartache and heartbreak. Turquoise is a stone for self forgiveness, self acceptance and the release of useless regrets, It encourages you to honour yourself as a creation and a tool of the Divine. 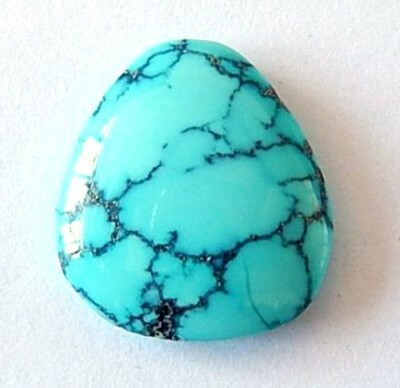 Turquoise is an excellent anti-hysteria stone. wear it to calm you if you overreact to situations. It is helpful for those who have Narcissistic Personality Disorder (NPD) (It is a personality disorder with a long-term pattern of abnormal behaviour characterised by exaggerated feelings of self-importance, an excessive need for admiration, and a lack of empathy. Those affected often spend a lot of time thinking about achieving power or success, or on their appearance. They often take advantage of the people around them. The behaviour typically begins by early adulthood, and occurs across a variety of social situations. Turquoise opens and softens hardness of the heart, it breaks down walls that you have put up around your heart. It heals people who say that they will never love again. This stone promotes trust, compassion for yourself and others, friendship and relationships. It will facilitate healing of your mother issues. Turquoise will help you learn how to be a mother and acquire nurturing skills. ​Turquoise helps you overcome feelings of being a martyr or symptoms of self sabotage. It instils inner calm and helps creative expression. Turquoise stabilises mood swings and stimulates romantic love. Turquoise will help you with feelings of exhaustion, depression and panic attacks. How about this rare white turquoise, no magnesite just dye blue. Turquoise bestows inner calm but still enables you to be wide . ; awake, lively and ready to act. It encourages good intuition and foresight. Turquoise helps you to know, speak and live your truth. This is a good stone when you need assistance with the timing of things. Know that the angels are orchestrating your life for you highest good. 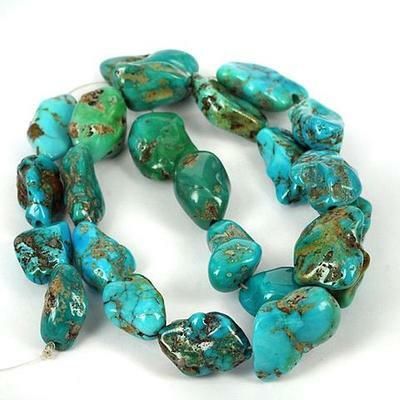 Turquoise is exceptionally beneficial for story telling, journalism and writing of any kind. It is a good stone to gaze at while waiting for inspiration to assist you with any type of project, especially when you are experiencing a mental block. This stone opens, clears and develops the thymus chakra. It connects the Kundalini and Hara Line channels at the thymus and throat chakras. It heals present life and past life blocks in the throat chakra. Blue turquoise opens, heals and releases present and past life fear and grief. This stone will heal sadness about you life and deeds. Heals karmic and present life shame and guilt. If placed on the third eye turquoise increases intuition and meditation. If placed on the throat chakra is releases inhibitions and allows the soul to express its self again. It is ideal for someone recovering from a separation or divorce as it releases you from the commitment that is no longer there. Turquoise is helpful in exploring past lives and it will show you that fate is ongoing and depends on what you are doing at each moment in your life. Turquoise helps you recognise the causes of fate that you have created for yourself and the results of which you feel later. Turquoise makes you aware that you are really the creator of your own luck. Turquoise helps you connect with cosmic energies. This is an ideal stone for channelling, automatic writing and communication with the angels. Turquoise represents the wisdom that comes from all of life's experiences. It is an ancient ally, counselling you that all experiences are valid and that mistakes are simply another experience. Turquoise reminds you that wholeness can only come when you are willing to embrace the totality of who you are and what you have learned on your Earthly path. ​Turquoise is a healer of the spirit, providing a soothing energy and bringing peace of mind. It will insure property and protect against accidents. It holds both a spiritual and protective property. It is considered by the Native Americans Indians, to be both a protective stone and bestower of goodness. ​Turquoise is an efficient healer, it provides solace for the spirit and well being for the body. It is a protective stone and has been used for amulets since the beginning of man. It is believed to change colour to warn of danger of infidelity. Turquoise promotes spiritual attunement and enhances communication with the physical and spiritual worlds. ​Turquoise is a purification stone that dispels negative energy and it provides protection against pollutants in the environment. It balances and aligns all the chakras and aligns them with spirit and physical body. It brings to together the yin and yang energies into the body. Turquoise is an empathic and balancing stone that prompts self realisation and creative problem solving. Because it affects the throat chakra it will help you in public speaking.